British teenager Catriona Parfitt has won this year?s Young Wildlife Photographer of the Year title in a contest that attracted a record 32,351 entries. The overall title went to American photographer Steve Winter. Both winning images were shot using non-professional Canon EOS camera gear. Catriona, 15, from Hampshire entered a picture of a lion poised to launch an attack on a giraffe near a watering hole in Namibia. She used a Canon EOS 400D digital SLR and 300mm f/4 IS USM lens. Competition judge Rosamund Kidman Cox described her shot as ?astonishing?. She added: ?Stage, action, story and onlookers combine to make an unforgettable scene.? 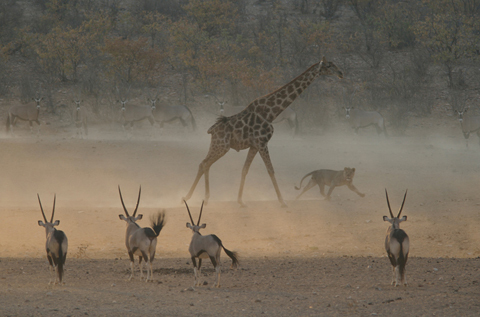 ?Perhaps a twitchy, solitary giraffe was just too much of a temptation for a bored lion because every time the giraffe got anywhere near the water, the lion loped down and chased it away,? said Catriona who lives in Swanwick, near Southampton. 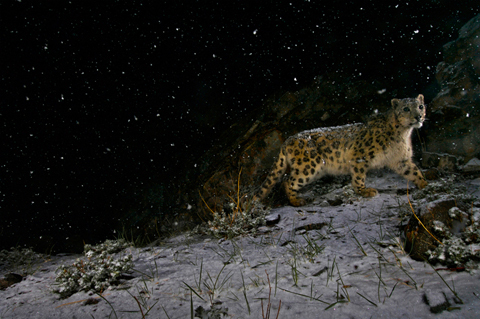 American photographer Steve Winter was named Wildlife Photographer of the Year 2008 with an image entitled ?Snowstorm leopard?, captured in northern India using a remote-control camera. Steve shot the winning photo using a Canon EOS Rebel XT (EOS 350D) and 10-22mm lens.